brim-strēam, m.n: the sea’s current, ocean-stream, the sea, ocean; a rapid stream, river. 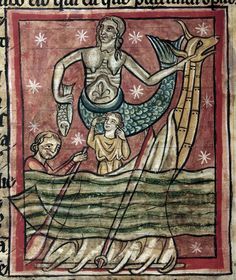 Image: Detail of a miniature of a siren, from a bestiary, with extracts from Giraldus Cambrensis on Irish birds, England (Salisbury? ), 2nd quarter of the 13th century. From the British Library Pinterest blog. This entry was posted in travel + trade, water and tagged Old English, sea. Bookmark the permalink.